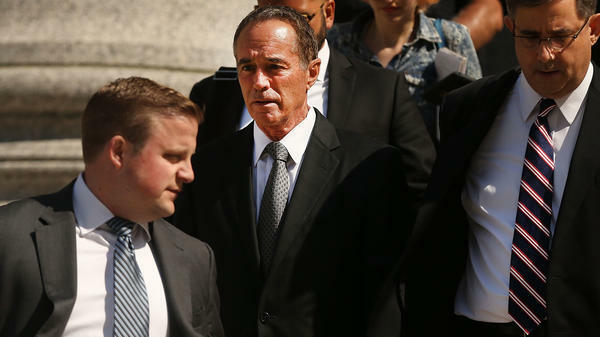 Rep. Chris Collins, R-NY, walks out of a New York court house. He faces charges related to insider trading. Rep. Chris Collins, the New York Republican who was indicted Wednesday on insider trading charges, announced Saturday he's suspending his re-election campaign. "I have decided that it is in the best interests of the constituents of NY-27, the Republican Party and President Trump's agenda for me to suspend my campaign for re-election to Congress," Collins said in a statement. Hours after being charged, Collins told reporters, "I will remain on the ballot." Collins had been a heavy favorite to win a fourth term in his western New York district, even after his indictment, as NPR's Scott Horsley has reported. He had also begun to gain a national profile starting in March 2016 when he became the first sitting congressman to endorse Donald Trump for president. But getting Collins' name off the ballot may be difficult. After they've filed for their candidacy, New York state law gives candidates a three-day window to decline to be on the ballot. That window was in April, so it isn't an option for Collins. Being convicted of a crime or pleading guilty is also not grounds for being forced off the ballot, according to John Conklin, director of public information for the New York State Board of Elections. Conklin tells NPR that at this point, there are only two scenarios that allow for Collins to be removed from the ballot: if he sells his house and moves out of state, or if he's appointed to another public office. That creates the possibility that Collins could remain on the ballot and win the election. If that happens and Collins resigns, New York's Democratic governor, Andrew Cuomo, would call for a special election. The Democratic candidate running against Collins, Nate McMurray, told a Rochester TV station he raised thousands of dollars in the 24 hours after Collins' indictment. "This indictment really puts this district in play," Bridget Bowman of Roll Call told member station WBFO. "Democrats were targeting this seat before but acknowledged that of the nine Republicans in New York state, this was much more of a reach for them." Federal prosecutors charged Collins with securities and wire fraud, conspiracy and lying to investigators. The government's indictment said Collins passed his son nonpublic information about Innate Immunotherapeutics, a biotech company based in Australia. Collins was one of Innate Immunotherapeutics' major investors. According to the indictment, he received an email in June 2017 with a crucial piece of private information: one of the company's drugs had failed a clinical trial. Collins allegedly called his son, Cameron, and shared the news. "The crime that he committed was to tip his son Cameron so that Cameron and a few select others could trade on the news while the investing public remained in the dark," said Geoff Berman, the interim U.S. Attorney for the Southern District of New York. Timely sales based on that information allowed Cameron Collins and Stephen Zarsky, the father of Cameron's fiancée, to avoid losses of more than $786,000, the indictment says. Cameron Collins and Zarsky were also indicted. All three men pleaded not guilty. "I believe I acted properly and within the law at all times with regard to my affiliation with Innate," Rep. Collins told reporters Wednesday night. "The charges that have been levied against me are meritless, and I will mount a vigorous defense in court to clear my name." Chris Collins had been on the board of directors for Innate Immunotherapeutics. Days after the indictment, the company's website doesn't list him on its board. But the company says one of its largest investors is Caitlin Collins — the same name as one of Chris Collins' daughters. NPR Lead Political Editor Domenico Montanaro contributed to this report.